As the prevalence of osteoporosis increases, it’s critical for professionals to focus on its diagnosis and appropriate treatment. Osteoporosis has been dubbed the “silent thief” because older adults can’t detect the gradual weakening of their bones, the hardest and most durable substance in the body. Long thought to be Mother Nature’s way of slowing humans down, osteoporosis is a disease characterized by low bone mass and structural deterioration of bone tissue, for which there is no cure. The U.S. Surgeon General considers osteoporosis a major public health threat. It’s estimated that 10 million people in the United States already have the disease, and 34 million more are thought to have low bone mass. Combined, those 44 million people comprise about 55% of the population aged 50 and older. Women account for 80% of osteoporosis cases in the United States. Older women are particularly susceptible, since they can lose up to 20% of their bone density within five to seven years of menopause. The National Institutes of Health reports that one in two women over the age of 50 will suffer a fracture of the vertebrae. Men are at risk, too, as the same study found that one in four men will also suffer a vertebral fracture. The annual costs to treat the 1.7 million fractures caused by osteoporosis stood at around $17 billion in 2005, according to the National Osteoporosis Foundation. This figure is expected to rise by nearly 50% by 2025. “The staggering cost to treat osteoporosis and its consequences alone is expected to break the federal budget in the next 20 years,” says Felicia Cosman, MD, an osteoporosis specialist and clinical director of the National Osteoporosis Foundation in Washington, DC. While the projected figures are ominous, there is hope that greater awareness will result in preventive lifestyle changes, the proliferation of available medications, and the advent of new and improved drugs. “We need more medicines as they become available, but there are already highly effective treatments for people of all ages and case levels, from the mildest to the most severe,” Cosman says. Osteoporosis literally means porous bones. Any bone can be affected, although the spine, hip, and wrist are most vulnerable. Following a hip fracture, more than 20% of patients die within 12 months. Spinal fractures can also cause immobility, chronic pain, and skeletal deformity. Sustained efforts to identify at-risk individuals and education about available treatment options are primary concerns for Joanna Davies, MD, director of The Osteoporosis Center of Los Angeles and an adjunct faculty member at the University of Southern California Davis School of Gerontology. She believes all women at age 65, whether or not they are taking hormone therapy, should have a bone density exam. “A bone density exam is more accurate in identifying osteoporosis than lipid levels as a measure of the risk for heart disease or blood pressure as a measurement for the risk of stroke,” she says. The bone density test, called dual-energy x-ray absorptiometry, is a noninvasive and painless procedure involving little radiation. It measures spine and hip bone density and can also measure the bone density of the whole skeleton. The exam is capable of detecting even minute percentages of bone loss. Osteoporosis is diagnosed when an individual’s bone mineral density is more than 2.5 times below that of a healthy young adult, according to the World Health Organization. Osteoporosis is a genetic disease with an adolescent onset. Early steps to improve exercise and diet can reduce its disabling impact in later years. In her book What Your Doctor May Not Tell You About Osteoporosis, Cosman wrote that every woman should follow a universal prevention plan that includes a nutritious diet low in sodium with sufficient levels of vitamin D and calcium, aerobic exercise that incorporates weight training, and healthy lifestyle choices that include moderate alcohol consumption and smoking cessation. “Even when you follow the universal prevention measures, if you’re genetically predisposed to get osteoporosis, you may end up having it or you may be at risk,” she says. For those inclined to the disease and for others at various stages of progression, currently available drugs can reduce the rate of fracture and, in some cases, even improve bone density. “We’ve come a long way,” Davies says. “Years ago, all medical professionals had to fight the disease was calcium, vitamin D, and estrogen.” The real challenge now, she adds, is diagnosing osteoporosis before it becomes severe. Another concern is the long-term viability of osteoporosis drugs. “We are in a dilemma over how long to use available medications. Forever or for five or 10 years—we have no real answers,” Davies says. Bone is living tissue; it breaks down and then builds up again. Osteoporosis results from an imbalance between bone breakdown, or resorption, and bone formation. Healthy bone constantly rebuilds itself. Osteoclast cells, which come from the bone marrow, dissolve older bone and leave behind tiny unfilled spaces. Osteoblast cells move into those spaces to deposit new bone. Bisphosphonates inhibit osteoclast action and slow the bone from breaking down. “About 75% of prescriptions involve one of these drugs,” Cosman says. The most common, alendronate (Fosamax), became available in generic form in February 2008. Considered a breakthrough drug at the time of its FDA approval in 1995, Fosamax was one of the first effective agents shown to reduce fractures. Since its release, it has also proven to be beneficial for long periods of time. Additional research is needed to address concerns of usage beyond 10 years. Some doctors worry that over time, bones may become overmineralized because the drug spreads itself throughout the human skeleton and stays in the body, sometimes for 10 years or longer. Experts are unsure whether overmineralization caused by bisphosphonates causes bones to become more susceptible to fracture. A very rare side effect of this class of drugs is osteonecrosis of the jaw, or “dead jaw,” which can cause joint collapse. “We recommend people should keep good oral health, but they don’t need to stay away from the drug,” Favus says. Other bisphosphonates include risedronic acid (Actonel), also a widely used oral drug taken monthly, and ibandronic acid (Boniva), which is taken once per month or four times per year intravenously. Zoledronic acid (Reclast) is given once per year intravenously and can last for 12 months following one infusion. Originally developed in 2001 to treat bone cancer, it was thought for years to be an effective treatment for osteoporosis. Approved by the FDA in 2007, the drug can be administered intravenously in only 15 minutes, is well tolerated, and “reduces hip and spine fractures as well as anything available on the market now,” according to Favus. Individuals on Reclast do not need to take anything other than calcium and vitamin D supplements, he adds, which are the building blocks for all these treatments. Hormonal factors strongly determine the rate of bone resorption. Estrogen regulates the activity of osteoclasts, consequently slowing the dissolving of older bone. For this reason, postmenopausal women with lower levels of estrogen are at increased risk for osteoporosis. “For all the bad press, hormones are actually good for the bones,” Davies says. For this reason, a class of drugs called selective estrogen receptor modulators (SERMs) is currently available as an osteoporosis treatment. “SERMs are important options, especially for those who may not respond to bisphosphonates,” Favus says. Also referred to as estrogen agonists/antagonists, the drugs work like estrogen on the bone, while at other sites, such as the breast, the drug acts as an antiestrogen. “This means they don’t stimulate breast tissue nor do they stimulate the lining of the uterus. They have even been shown to reduce the rates of new breast cancers,” Favus says. Another SERM in development is lasofoxifene, which is reported to have a high affinity for estrogen receptors. Like raloxifene, the drug also acts as an agonist in the bones and as an antagonist in the breasts. Early reports, based on the Postmenopausal Evaluation and Risk-Reduction With Lasofoxifene trial, which was conducted over a five-year period with 8,556 women between the ages of 59 and 80, are that it has an effect on reducing nonvertebral fractures but no significance in preventing hip fractures. Side effects of all SERMs can include hot flashes and leg cramps and an increased risk of deep vein thrombosis and pulmonary embolism. An available drug that actually restores the architecture of the bone is teriparatide, an injectable human parathyroid hormone known on the market as Forteo. “It’s only a short-term therapy, not recommended to be used for over two years, but it truly stimulates the growth of bone tissues,” Cosman says. Often used in the most severe cases of osteoporosis, injections are taken daily for 24 months, after which other medications are substituted to maintain bone growth. A study conducted by the Osteoporosis Center at Massachusetts General Hospital found that women who received Forteo were nearly 90% less likely to experience severe or moderate spinal fractures compared with those who received a placebo. Forteo is often used by people who already have had fractures or for those taking steroids, which are prescribed to treat diseases such as asthma and lupus that can weaken bones. Price varies by location, but at around $700 per month, it is very expensive. Two new biologics (drugs synthesized from living organisms), Denosumab and Odanacatib, are within several years of FDA approval. Both target osteoclasts, which are the cells that break down bone to make way for new bone. Favus calls Denosumab “the first of the rational planning drugs.” A human antibody, it targets receptor activator of nuclear factor kappa b ligand (RANKL), a protein that acts as the primary signal to promote bone removal. In individuals with osteoporosis, RANKL overwhelms the body’s natural defense against bone destruction. Completed last September, the Fracture Reduction Evaluation of Denosumab in Osteoporosis Every 6 Months study, a large phase 3 trial of Denosumab with more than 7,000 participants, yielded impressive results. The drug was well tolerated with no major short-term side effects and showed reductions in both hip and spine fractures. Cosman believes Denosumab, administered twice per year by injection, may be available by the end of 2009. “An advantage over the bisphosphonate class is that it’s not contained in the skeleton; it completely washes out with no residual effect,” she says. Odanacatib is not as far along as Donosumab, with its phase 3 trials just getting underway, but initial results from a phase 2b trial appear positive. 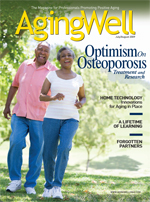 In a multicenter, double-blind, randomized, placebo-controlled study in postmenopausal women with low bone mineral density, the subjects took an Odanacatib pill or a placebo once per week and found that two years later, the women who took the drug had significant gains in bone mineral density in the lumbar spine and hip. The biologic approach in this drug targets an enzyme called cathepsin K to reduce osteoclast activity. To battle the debilitating effects of the “silent thief,” experts call for greater awareness of its devastating ramifications on individuals and on a societal level. They call for more exposure in the media, along with new research for finding a cure and a push for physicians to increase diagnosis efforts. “Efforts from the government, media, and physicians need to use a multifactorial approach to educate people about cost-effective treatments to avoid a potential disaster,” Cosman says. A bone scan, an improved diet, a fall-prevention exercise class, dietary supplements such as vitamin D and calcium, and one or a combination of prescription drugs are far less expensive than treating a potentially debilitating or even fatal fracture. Strontium ranelate, a compound of the chemical element strontium, is a popular osteoporosis treatment marketed as Protelos or Protos in the European Union. It is currently unavailable as an osteoporosis drug in the United States. Murray Favus, MD, of the University of Chicago Medical Center, would like to see strontium ranelate given a trial in the United States but doubts it will happen because of expensive trial costs that could lead to companies sharing profits. “Strontium is an element, so anybody can make it; it’s cheap and not hard to purify. Most drugs need to have a financial aspect. The government doesn’t support drug advancement in this country; the pharmaceutical companies do,” he says.